On 15 March 2016, 278 Ukrainian MPs voted to approve a new e-declarations law called No.3755. The law will oblige public servants, politicians, managers of state and communal enterprises, and other employees who are paid from state budget such as doctors and teachers, to declare their full income and assets. It also requires them to report any cases of corruption to the authorities. Before the new law was approved, it went through many rounds of delays and amendments where it would have potentially let any corrupt official off the hook for submitting unreliable information. 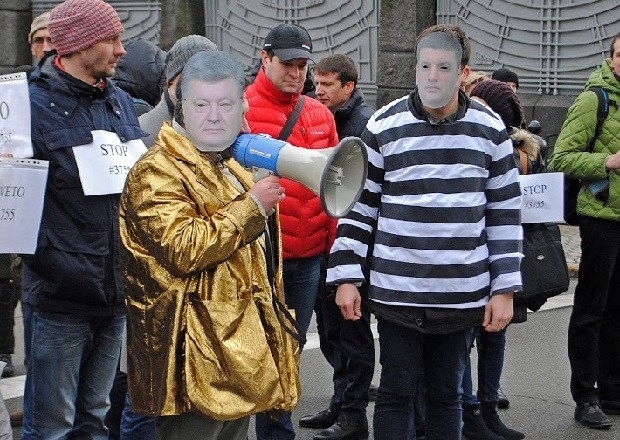 “These amendments mean that introduction of the new system will not lead to real punishment of corrupt officials who were detected during the declaration checkup this year” – says the Declarations under Control coalition which includes six organizations: Transparency International Ukraine, Centre for Political Studies and Analysis, Civic Lustration Committee, Media Law Institute, White-Collar Hundred, and Centre for Local Self-Government. The Reanimation Package of Reforms civil society platform has presented a similar statement. The coalition urged President Poroshenko to veto the law in its previous version because it was toothless. The declarations would have been meaningless since there is no liability for giving false information in declarations. Under pressure from the EU and the active civil society in Ukraine, President Poroshenko did not sign the law, vetoed it and returned to the Parliament with new changes made in collaboration with the EU and Ukrainian civil society. With the e-declaration system, officials can now submit declarations of their assets and incomes electronically in a more efficient way instead of submitting papers. The law will also enable Ukraine to be part of the European Union’s visa- free travel arrangement. This, together with other anti-corruption regulations already in place, are necessary for Ukraine to build an effective system in preventing and fighting corruption.